The Smart Route through Acocks Green seems to have been on the agenda for ever. In fact we first started talking about the Smart Route in 2009 but we had been talking about re-designs for Acocks Green centre since long before that. Why might we want a redesign … take a look above. Attractive? Inviting? Best use of space? Pedestrian friendly? Cyclist friendly? Driver friendly? Anyone friendly? Can’t we do better than this layout which seems to have been slapped down in the 1960s and left undisturbed since? Yes we can. What’s a Smart Route? A Smart Route is a route, on a main thoroughfare which combines the red route approach (double red lines, no stopping) with easy progress for buses. What does this mean for Acocks Green? It means a lot more than the bare description above. A lot of money is being invested in this particular Smart Route and we get a lot of goodies thrown in with the basic requirement. Our Smart Route is now set to run from just before Station Road up to Dolphin Lane. The central reservation starting at Sainsbury’s will disappear. There will be a single carriageway and a 20 mile an hour zone. A zone is stronger in effect than a simple speed limit and involves traffic calming measures. All the new space either side (look at the clunky layout and wasted space above) will be used for extra pedestrian space, diagonal parking bays, cycle parks and an avenue of trees. Out will go clunky street furniture too. In will come a new streamlined, ‘de-cluttered’ look. NB these will download at 36.2% of full size, but by using the drop down arrow next to this size information at the top you can chose the viewing size that is comfortable for you, and then use the blue arrows at the bottom and right side of the image to move in and out of sections. Do bear in mind that these are both still works in progress. The consultation has not finished until Friday 16 August, and there will be two events in Acocks Green Library on 8th and 10th August in connection with the Consultation. You can also check out the Birmingham City Council’s Be Heard website here. (NB consultation date now extended to 16 August.) (Remember though that this contains another nine longer-term plan sheets which are not relevant to Acocks Green centre . Our Acocks Green focussed pick above is to give you the vital info for the centre. We were told that it is intended to make Acocks Green the first suburb of a new kind in the city. This is why they are keen to get it right. Other suburbs will get this re-design treatment later. 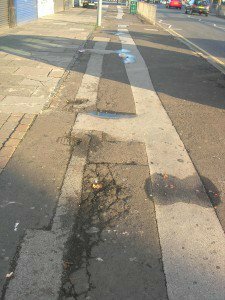 It is planned that all those broken and ugly surfaces will be replaced by small, fairly smooth small blocks of granite-like brick, approximately 600 x 400 ml, and slightly darker bricks for kerb stones. This is a picture of a damaged pavement surface near Pound Stretcher. The new small blocks will be simple to place and easy to maintain. We will not see this sort of sight again. New granite style blocks – NB this is a guess at final appearance based on the blocks which are available for viewing. 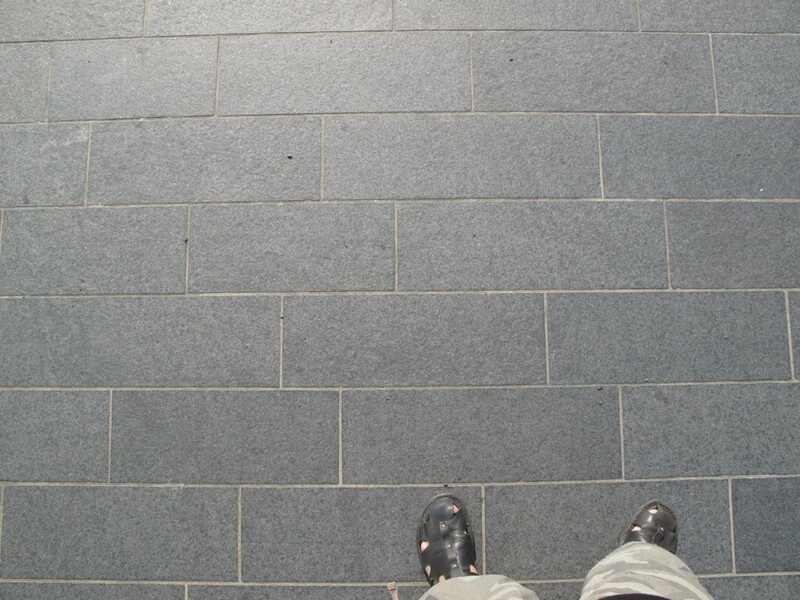 The new blocks will not be ultra-smooth, in order to avoid the ice-rink effect in bad weather: there will be a little grip, but at the same time they will avoid the opposite extreme and problem of a rough York Stone type surface used in some heritage areas, which can make it very difficult for disabled people to manoeuvre any sort of wheeled aid and difficult for prams and pushchairs. Whether it is because of the impossibility of parking near where you want to be, or because you are annoyed by where someone else has parked, parking gets everyone in Acocks Green going as a topic. We are can all talk for England (Well, Acocks Green anyway!) about it. We will get diagonal parking bays behind the double red lines. These will operate on a free short stay basis of probably an hour (still to be decided) and no return within one hour. (Have a look at the system on the Stratford Road in Shirley to see how this can work very successfully.) This is to give you time to stop off and grab those bits and pieces or do your banking or drop into a cafe or the library without cruising round for hours looking for a spot. What happens if an hour is not enough? It is possible that Station Road will become two way up to and including the car park entrance there, in order to make it easier to use this car park. There will be a six to twelve month trial to see how this would operate. Street lighting, like other street furniture, will be in green and gold and in heritage style design. Where appropriate some lights will be of the LED type – see left. 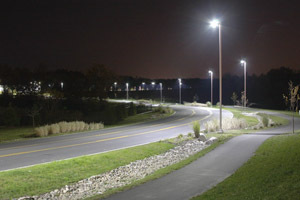 This is more energy efficient and gives a softer but more directed type of light, whereas traditional sodium street lighting means that a lot of light simply adds to light pollution up in the sky and causes glare for drivers and pedestrians. There is a report on a study on the effects of introducing LED lighting here. We still have some reservations about using pedestrian controlled lights where there is already a twenty mile an hour zone. However, if there are ‘assisted’ crossings these will be straight across. The staggered cattle pen crossing near Oxford and Victoria Roads will go. It is likely that there will be ‘stub’ Pelican lights. These work as normal but are less obtrusive, see picture. The available draft plan suggests that there will be no right turn out of Oxford Road. This has already been dropped as an idea (As has the Woodcock Lane no right turn.) Local people have pointed out that vehicles emerging out of these roads will then be sent into the general traffic flow of The Warwick Road, causing more congestion than is needed. However, there is a locally well-known difficulty here. This is an awkward, slightly staggered junction and there is a history of accidents. Narrowing the road and imposing the 20 mph zone should help, but a small island for further traffic calming has several times been suggested as the answer. This seems better than doing nothing, but would take additional funds and can have the effect of discouraging pedestrians. Is there any other way of dealing with the problem here? We liked the highly successful and much praised Shared Space ‘island’ scheme that is in use at Poynton. Our Transportation friends at BCC are currently looking into this kind of an approach. (This one itself is more expensive and elaborate than would be needed: horses for courses, every Shared Space scheme is different. All street furniture will follow the green and gold theme – green for Acocks Green as most of us voted for on the Acocks Green Village face book page, but street furniture will be kept to a minimum wherever possible. This is in line with the new less cluttered smoother layout look for streets which has been shown to be easier to maintain and to help bring people back to suburban shopping streets. 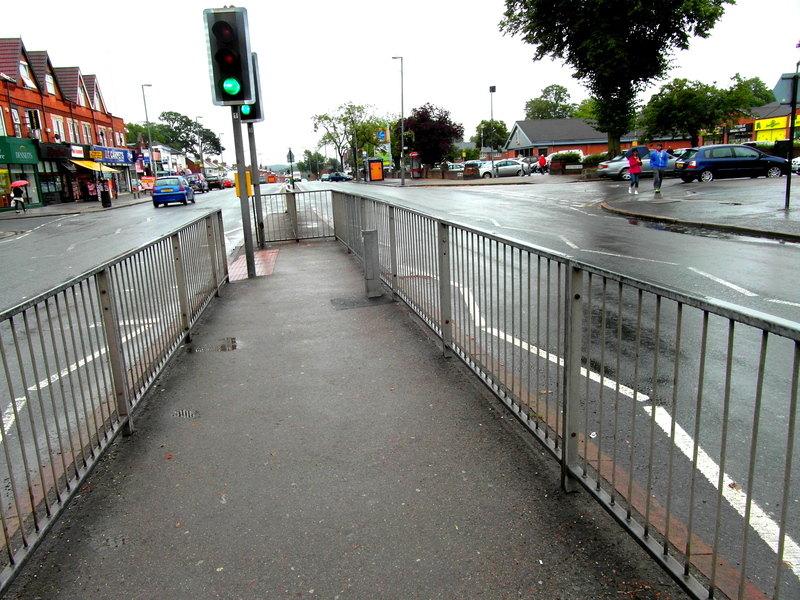 Guard railings are very expensive to maintain and areas with heavy amounts of guard railing have now been shown to have higher accident rates because the railings encourage drivers to speed and can obscure vision. They were originally largely introduced to prevent pavement parking, but there are better ways. Who came up with these ideas? The ideas have been formalised by transportation engineers and landscape design specialists using recent research and thinking set out in guides like Manual for Streets 2, tested by safety experts and costed for feasibility. However, most of the keys ideas, like the narrowed down road, the parking bays and the trees come originally from local people who, together with local traders, politicians council officials and Centro representatives have been talking about what the centre really needs since The Green was saved from a poorly thought out scheme in 2004. ‘The Smart Route’ by that name though, has been under discussion since 2009. When will this start and how long will it go on for? The scheme is scheduled to start in the spring of next year, probably around April. It will finish in March 2015 – it is essential that it finishes at this time because this is a condition of the agreed government funding. What will happen to the shopping centre whilst all this is going on? The shopping centre will stay fully open with access to all frontages. Road works are likely to run only from 9 am to 3 pm. I thought Brum was hard up. Where’s the money coming from? It is coming from a special Government fund for projects to improve roadways: ‘The Local Sustainable Transport Fund’ and from Centro, the bus company. This is not Council money. What are the politics of this? Where do the parties stand? We are pleased to be able to report that the Acocks Green centre re-design project has been non-party political from the word go. In 2012 Conservative, Green, Labour and Lib-Dem Council election candidates all made pro Smart Route statements on the Acocks Green Focus Group website. Members of all four parties have been attending consultations, meetings and events on the Smart Route for years. The incoming 2012 City Council Labour administration picked up the plans from the Conservative administration and carried on. This is all very well, but haven’t you noticed the problems at either end of this stretch? Dudley Park Road layout and parking is a mess, and as for that triangular area as you come into Olton Hollow, at the bottom of the hill out of the shopping centre towards Solihull … the accident rate is appalling! There is to be a separate review of the Olton Hollow situation very shortly and there was some further consultation with local residents and traders in that section straight after the Smart Route discussion on 26 July. The area of the Dudley Park Road exit on to The Warwick Road is part of a bigger and more complex problem which we have been around (often quite literally, clutching clip boards, cameras, leading various experts, etc) for years. The trouble is that DPR impinges on a different discussion to do with traffic flows around The Green. The Green also needs a re-think . A re-design for The Green area is also still on the cards when the funding can be found but finding a solution which suits everyone – and most importantly keeps the feature of The Green – will be very complex and costly, far more so than the straight stretch of the Warwick Road, which was why, in 2010 a big meeting of delegates from local groups in Acocks Green finally fixed on ‘de-dualling’, i.e. removing the dual carriageway and making a two way road, as the first priority to get things moving. This entry was posted in Events and tagged Acocks Green, Acocks Green Library, Focus Group, Public Consultation, Smart route, Warwick Road. Bookmark the permalink. 3 Responses to Smart Route in AG – What Do You Think? This all sounds well and good but what about the ignorant people who turn right from Station Rd onto Warwick Rd and visa versa,or the ones who park on Station Rd without displaying a Blue Badge and also parking along the Warwick Rd by the shops as its convenient for them. I witnessed a man run over by an idiot in his boy racer car who overtook the waiting line of traffic on Station Rd and shot out onto Warwick Rd knocking the man over, I have seen Taxi drivers do the same thing, if the railings are removed you will see cars parked there and people pulling up to drop off or pick up or sit in their cars with the kids while their wives are in the shop. there is also a lot of yobs on their Quad bikes and Motor cycles bombing around the roads more than once I’ve had to swerve or slam on my brakes to avoid them, it used to be a lovely shopping area but not now which is a shame. I have sent E-mails to local Cllrs but it amounted to nothing. Fantastic amount of info. Ged, (THANK YOU) I really look forward to the changes, it must be an improvement to the roads as they are at the moment. Glad there is a chance to talk at the library on 8th and 10th August. Thanks to Julia Lardon for compiling the information, which is taken from the Focus Group’s website.